Just finished having these for dinner! Made a few changes: Used Dijon mustard, and used sliced American cheese and mozzarella. I didn’t have left over ham, which would have been amazing, so I just used what was on sale at Walmart and had them slice it thick like spiral cut ham! They turned out great! 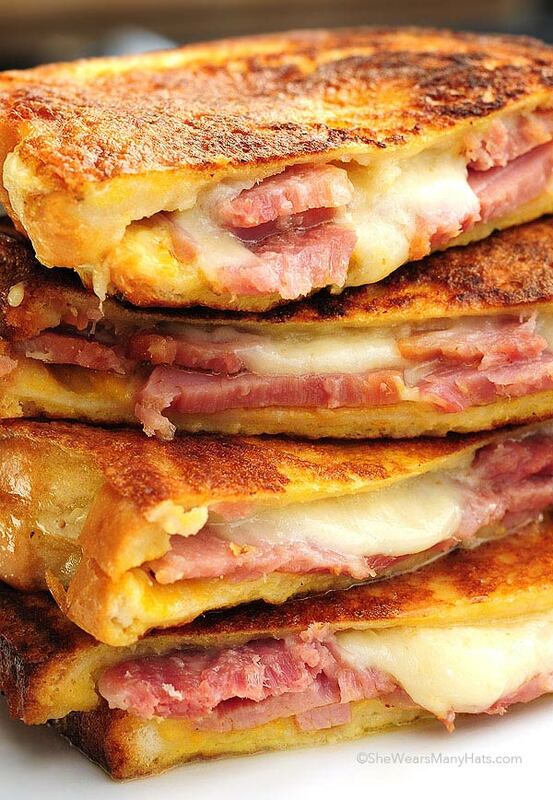 Like a grilled cheese sandwich with ham! The mustard gives it an extra kick, especially the Dijon! Mmmm. Also – I was thinking about the idea of preserves or confectioners sugar on the side. Something sweet! So I had some home canned peaches with it. Hit the spot perfectly! If you’re not putting anything on it, I’d suggest a sweet side dish to go with it! Thanks for the recipe! Over medium heat melt butter in skillet.